THURSDAY 11 A.M. UPDATE: Attorneys are presenting their closing arguments now. The jury will then deliberate until a decision is made. More information will be available this evening. Pictured is what was left of a home at 3043 Liberty Rd. after a fire took place June 30, 2011. Charles “Sparky” Sparks was fighting the fire when he suffered a heart attack. He died July 8, 2011. BOWLING GREEN, Ky. ­– Steve “Boo” Pritchard sat in a federal courtroom Monday morning and listened as firefighters shared their horrific memories of the day their comrade, Charles Sparks, collapsed while fighting a house fire. Sparks died eight days later. Pritchard is accused of setting the fire for financial gain. He faces federal charges of mail fraud and arson with a possible enhanced penalty because the fire caused the death of a public safety officer. The Columbia-Adair County Fire Department was dispatched to the house fire at 3043 Liberty Rd. at 3:05 a.m. on June 30, 2011. Federal prosecutors say Pritchard set the fire after his then girlfriend Brandi Waggener purchased a $50,000 renter’s insurance policy. Waggener and Pritchard were married the following January. Brandi Pritchard pleaded guilty in May 2017 to charges of setting the fire and using false pretenses to obtain the insurance money. She is scheduled for sentencing on July 31. Steve Pritchard faces two mail fraud charges with additional penalties if the jury determines that arson resulted in the personal injury of a public safety officer performing his duties. The federal mail fraud charges apply because Brandi Pritchard received two payments from the insurance company through the mail. The criminal trial began Friday with jury selection and opening statements. On Monday morning, testimony began with members of local emergency services taking the stand. Former firefighter Brandon Lewis described the early morning tragedy as Assistant United States Attorney David Weiser played back recorded calls to emergency dispatch. Firefighters were on the scene of the fire at 3:12 a.m., but by 3:47 a.m., the priority changed from fighting a fire to taking care of one of their own. Lewis was on the second story of the house when Sparks climbed a ladder and entered through a window. Lewis spoke briefly with Sparks and turned the corner to head downstairs when another firefighter yelled that a firefighter was down. “I immediately threw down my hose and looked at him and said, ‘We have to get him out of here,’” Lewis said. Lewis and firefighter Billy Hadley carried Sparks down the stairs then others stepped in to help. “Every step I took I was screaming, ‘Man down,’” Lewis recalled. Firefighters began CPR on Sparks and resuscitation efforts continued as Adair County EMS transported him to the hospital. Sparks never fully regained consciousness and died on July 8, 2011. As Weiser questioned emergency personnel Monday, he often removed items from a box containing Sparks’ firefighter equipment. Throughout testimony all week, Sparks’ helmet was positioned on a counter with his unit number 16 visible to the jury at all times. Weiser led firefighters and EMS through the events of June 30, 2011, but he also gave jurors a glimpse of the life of Charles Sparks. Sparks was an assistant fire chief and training officer with the volunteer fire department and worked full-time as a state fire marshal. Glasgow, the chief of the city department, said Sparks was respected across the state, something evident when 1,500 firefighters came for visitation after Sparks died. Glasgow recalled how firefighters stood on 11 overpasses on I-65 as the fire truck brought Sparks’ body home from Louisville. The U.S. Attorney’s Office contends that Sparks died because of the physical exertion involved in fire suppression. Dr. Thomas Hales co-authored a report about Sparks’ death for the National Institute for Occupational Safety and Health. While Hales said Sparks had increased risk factors for a potential heart attack because of unchecked diabetes and history of a past heart attack in 2005, he said the heart attack that led to his death was triggered because of the increased cardiovascular efforts from fire suppression duties. Prichard’s attorney, Donald Meier, centered his questions on Sparks’ health and suggested that Sparks could have had the heart attack had he not been fighting a fire because of his risk factors. Hales said there is a difference between risk factors and a trigger, again saying the physical exertion triggered the heart attack. At the time Sparks collapsed, firefighters were just getting the fire under control. Following the medical emergency, all priorities shifted and the fire was not extinguished. Ultimately, the house was a total loss, and that loss made it impossible for experts to determine the cause of the fire. Two experts were called to testify Monday, one who examined the property on behalf of Kentucky State Police and another who was there on behalf of the insurance company that insured the property. Both men said the destruction kept them from being able to determine a cause. Jim Hunter, an inspector for Grange Insurance Company, said there was evidence indicating the fire started on the second floor. He also said he did not believe an electrical box on the house was the origin of the fire. Questions by Meier centered around comments Brandi Pritchard made to investigators about concerns with the house’s electrical wiring. Hunter confirmed that Brandi Pritchard told him she had received a call from the electric company notifying her of a spike in usage. 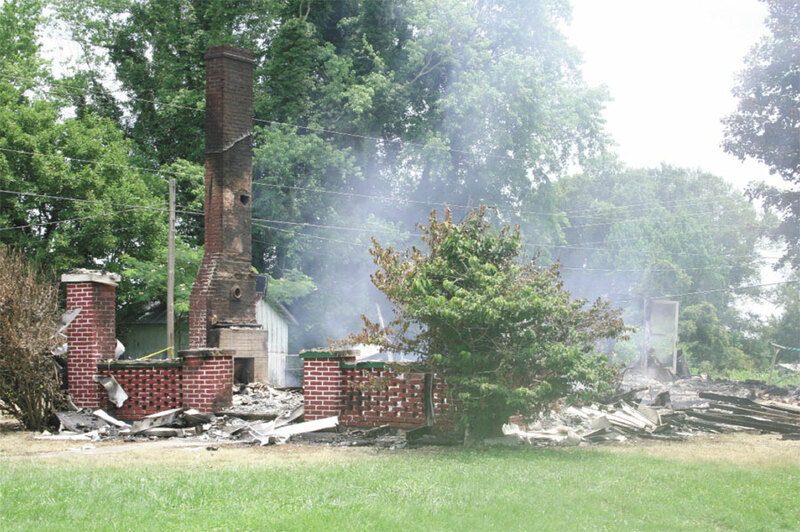 While prosecutors lacked physical evidence that the fire had been intentionally set, a former Adair County resident testified she heard Steve and Brandi Pritchard admit they started the fire. Sherry Wagoner said she and the Pritchards had mutual friends. One day in 2012 the couple dropped by Wagoner’s house while waiting for the mutual friend to return home. Wagoner said the couple was arguing because Steve Pritchard purchased a motorcycle with the insurance money and Brandi wanted to purchase a car instead. Wagoner said she was told Steve Pritchard set the fire in the upstairs and Brandi set it downstairs. “He was proud he got by with it,” she said. Wagoner said after hearing the conversation she went to the Kentucky State Police post and shared the information with an arson investigator. Meier, the defense attorney, questioned Wagoner’s motive for contacting police, citing a family disturbance at her house and an argument between her and the Pritchards. Wagoner’s husband, Robbie, said he could not remember hearing the Pritchards admit to starting the fire. He testified before a grand jury in 2014 that he heard the conversation. Wagoner had also told the grand jury that Steve Pritchard bragged about setting cars on fire but he balked Monday when asked about the comment. Wagoner said it had been too long for him to remember the conversations but admitted to giving the testimony before the grand jury. Kim Baker testified that Brandi Pritchard’s son often stayed overnight at her house. The only time, however, that Steve Pritchard’s dog spent the night at her house was the night of the house fire. On Tuesday, Brandi Pritchard spent around four hours on the stand as she admitted to lying for almost three years about her role in the fire and insurance fraud. She said Steve told her burning the house would be an easy way to make money and it was something he had done before. She told of several instances where he said he burned houses and at least one vehicle to help people collect insurance money. Brandi purchased the renter’s insurance policy on June 24, 2011, less than a week prior to the fire. She said she didn’t purchase it with the intentions of committing fraud, but Steve started the fire on the morning of June 30, 2011 while she waited for him in the car to drive her to work. She said he told her he started the fire as he pulled away but she looked back and didn’t see a fire so she didn’t believe him. Brandi Pritchard said she lied about the events that took place the morning of the fire because she was afraid of Steve Pritchard. He was abusive, and the insurance was in her name and Steve threatened to put the blame on her if she didn’t go along with him, she said. She admitted she exaggerated the cost of some items and added items that didn’t exist to the insurance claim report but said Steve Pritchard instructed her to do it. The prosecution planned to call more witnesses Wednesday morning and hoped to wrap up its case by lunchtime. The defense is expected to take a day or more to present its case but U.S. District Court Judge Greg Stivers said he was hopeful the case would end Thursday afternoon or Friday at the latest.